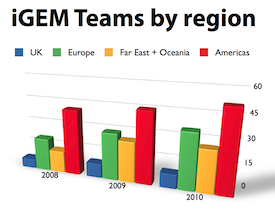 Each year we recruit 6-12 undergraduate students to participate in the iGEM competition. The students work as an interdisciplinary team to construct an engineered biological system from DNA components, including design and construction of instrumentation, human interface and outreach activities. The annual project starts at the end of June, and runs through until the start of the next academic year in October. The team is based in the Department of Plant Sciences, University of Cambridge. The first two weeks of the competition include a crash-course in Plant Synthetic Biology, with brain-storming and practical exercises, exchange visits with the John Innes Centre, access to state-of-the-art laboratory facilities and workshops and attendance at the global iGEM Jamboree at Boston, USA in November. Interdisciplinarity and teamwork. Students from Biology, Engineering, Computing and the Physical Sciences participate in the iGEM team. Hands-on practical experience. The iGEM competition provides laboratory experience with the handling of synthetic biological systems to provide better grounding in practical skills for future project work. Project and group based learning. Students share team work in laboratory work, biological design, project management and presentation. Student exchange. In addition to promoting improved collaboration across Cambridge, participation provides opportunities for links with scientists at the John Innes Centre, collaboration and international exchange. Lab resources. The iGEM team will have access to labs equipped for handling biological systems and construction of hardware, including 3D printing. Open Instrumentation. 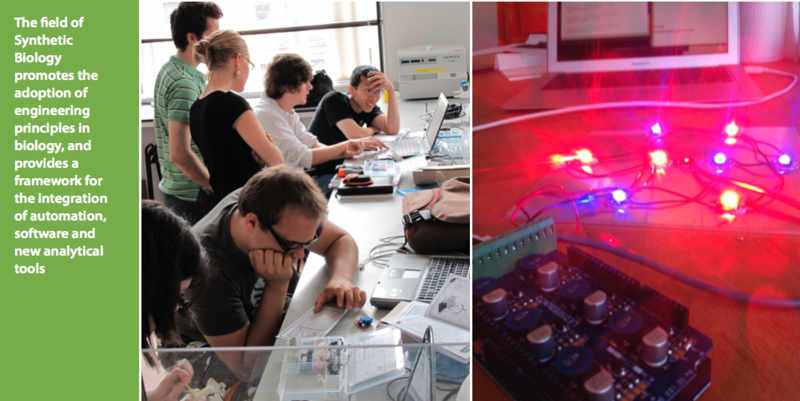 Students will be able to work with Arduino and Raspberry Pi-based microcontrollers and interface these with optics, microelectronics and motors for DIY instrumentation. Faculty advisors for this year's team are: Jim Ajioka (Pathology), Alexandre Kabla (Engineering), Jim Haseloff (Plant Sciences) and George Lomonossoff (John Innes Centre). In addition the team has access to a strong support team of postdoctoral and postgraduate advisors. 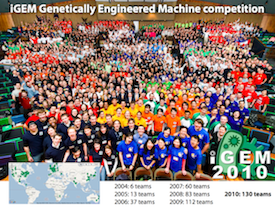 The international Genetically Engineered Machine competition (iGEM) is an interdisciplinary contest in Synthetic Biology for undergraduate students. The competition is held in the spirit of robotics competitions in engineering fields, except that the students face the challenge of conceiving, designing and implementing a synthetic biological system using standard, interchangeable DNA parts or “BioBricks” and operating it in living cells. The iGEM competition began in January of 2003 with a month-long course during MIT's Independent Activities Period (IAP). The students designed biological systems to make cells blink. This design course grew to a summer competition with 5 teams in 2004, 13 teams in 2005 - the first year that the competition grew internationally and Cambridge joined. The competition has continued to grow rapidly, with 32 teams in 2006, 54 teams in 2007, 84 teams in 2008, 112 teams in 2009 and 130 teams in 2010 - and now number over 300 teams worldwide. Over the years, projects have ranged from banana and wintergreen smelling bacteria, to an arsenic biosensor, to a bacterial blood substitute, microbial buoyancy, light emission and biopigments.